Midfielder Jordan De Goey could soon be welcomed back by Collingwood, according to club president Eddie McGuire. The 21-year-old was suspended indefinitely from the senior side last month but McGuire feels he's now been punished enough, after being forced to train with the VFL squad at night, after spending his days working as a landscaper. 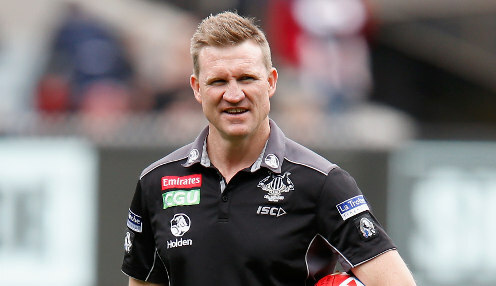 McGuire conceded that the Magpies couldn't afford to have a player of De Goey's quality on the sidelines for long. "There's a number of factors there that we'll take into account. He's been punished enough and he's learning his lesson," he said. "We will do what's right for the club. Clearly we're not in a position where we can waste good players. We need to have everyone up and running for us to be a in with a chance in 2018 but it is a long season. "We'll get him physically right, we'll get him mentally right and we'll get him spiritually right and when he's at his optimum to play again ... he'll be right to go. I think he'll make a pretty early return to our team." De Goey has played 50 games for the Magpies since being drafted at No.5 in 2014. He kicked four second-half goals against West Coast in round 18 last year and was influential in an intraclub last month. Meanwhile, Fremantle are hoping reigning club champion Bradley Hill will get good news over a suspected quad injury. Hill failed to complete Wednesday's training session and looks certain to miss Sunday's final JLT Community Series clash with West Coast. The Dockers are waiting for scans on the 24-year-old as they finalise their plans for their round one trip to Port Adelaide. Hill's older brother Stephen has already been ruled out of the upcoming contest with the Eagles as he battles a calf issue. Fremantle are 1/1 to win their season-opener against Port Adelaide, who are 1/1. The Dockers are 1/1 with a 24.5-point start.